The 5 Series Touring model may have started life as something of an afterthought from German Manufacturer BMW, but it has more than made up for its delayed start in life since arriving in 1991. The fourth generation builds on the work of the recently introduced sixth generation 5 Series saloon, but with a traditionally more practical rear. Since the estate, or Touring, version of the BMW 5 Series arrived on the scene in 1991 it has proved extremely popular with drivers in the medium executive car market owing to its increased practicality over the saloon without the need to sacrifice style or performance. The new fourth generation model carries on the good work of its much admired predecessors. The key difference between the previously unveiled sixth generation 5 Series saloon and the new fourth generation Touring model is clearly the more accommodating rear end. Larger than ever, the new model's boot space features a host of innovative features on top of the now expected 40-20-40 split rear bench and flat load floor, including the split rear tailgate that's been popular in previous models and a rear bench back that can be adjusted in seven stages across 11 degrees to offer more load space. Beneath the boot floor BMW has employed a self-levelling air suspension system that ensures consistency in ride comfort and vehicle handling regardless of the load onboard. Like the saloon model, the exterior styling has been toned down but remains contemporary, while the interior ambience is similar to that of the 7 Series, with standard leather and high-gloss finishes contrasting with the metalwork detailing. The 5 Series Touring range benefits from the same line-up of three petrol and four diesel engines as the saloon, all of which are the recipients of Efficient Dynamics technology to maximise fuel consumption including gear shift indicators, brake energy regeneration, active aerodynamics and stop-start for the manual 520d. The most efficient model in the range, the 520d is also available with BMW's eight speed automatic gearbox. With more space and less controversial styling the new BMW 5 Series Touring is unlikely to struggle in its quest to attract buyers. Owners of the previous generation model will find the new version considerably improved and the efficiency – in particular from the 520d – will doubtless prove attractive to drivers of 5 Series rivals. Refined and assured on the road and brimming with quality, it bears all the BMW hallmarks. The 520d boasts some very impressive fuel consumption and CO2 emissions figures, meaning it will prove cost effective to own for drivers seeking a large executive estate. Residual values invariably prove strong for BMW products and although the 5 Series Touring is not a cheap vehicle to purchase, it does come with generous standard specification. Consumables such as run-flat tyres will be relatively expensive, however. The Touring model is designed to offer increased practicality, which it does with an even larger boot than the previous generation model. A new feature comes in the shape of the rear bench that, as well as being lowered to offer a flat floor and operating in a 40-20-40 split configuration, can also be raised incrementally to offer greater load space in the rear without sacrificing the rear seats. The split tailgate proves a very useful feature and storage in the front is adequate. With BMW's i-Drive technology having steadily improved over time, it's now become surprisingly intuitive, and controls many of the car's functions: ventilation, audio, satnav, telephone. The car's main display and instruments are all up to BMW's usual high standard, but the auto gear lever requires a little practice to be fully comfortable with. The column stalks are short and stubby but have a quality feel. For a car expected to rack up the miles, engine and road noise has been reduced to impressively low levels. Ride comfort is top notch in standard form or when selecting the comfort setting on the adjustable chassis. A spacious interior aids the relaxing ambience inside the cabin and standard equipment levels mean adjustability of seating and environment for driver and passengers. Rear legroom would be even more generous of not for the thick front seat backs. Like its predecessor, the new 5 Series Touring benefits form a Thatcham Category One alarm and immobiliser package and is available with a keyless entry and start feature. Concealed storage in the cabin is adequate and the boot contents are covered by a one-touch retractable blind. 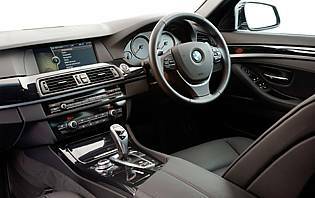 The 5 Series provides a wealth of safety features from two Isofix points in the rear and a full compliment of airbags to systems that unlock the doors, cut off the fuel supply and activate warning lights in the event of an accident. Dynamic stability control adds an extra layer of on-road security while run-flat tyres prevent blowouts causing loss of control. 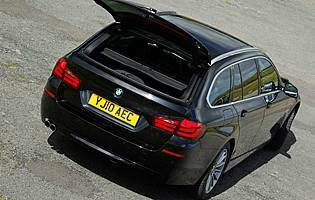 The 520d Touring doesn't suffer from having a bulkier rear – cornering with similar good grace to the nimble saloon. The smaller, more frugal engine lacks the surge of the six-cylinder diesel and petrol units, but can not be accused of being underpowered and gets up to speed with considerable ease. The optional eight-speed automatic gearbox makes the most of the quiet and refined unit's attributes and, while adjustable suspension can be specified for keen drivers, the standard setup is excellent for long distance cruising. 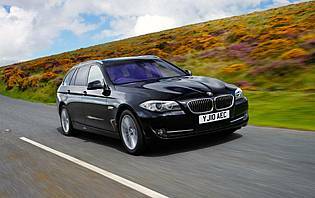 Spacious, practical and safe, the 5 Series Touring could fair well as a dual purpose executive and family car. It would, however, be a shame to see the well-appointed interior suffer at the hands off young children. A large and relatively expensive model, the 5 Series is unlikely to pop up on the first car radar. Even drivers opting for their first company car are more likely to find a smaller 1 Series or 3 Series more suitable. The 5 Series remains an executive choice. The previous model, although a strong seller, at first divided opinion with its controversial styling. The new Touring model displays and more restrained appearance, and one that's likely to generate wider interest from conservative buyers. BMW's Efficient Dynamics sub-brand has done wonders for boosting sales of frugal models and the German manufacturer's image as a builder of stylish, reliable, nimble, and solid vehicle is second-to-none. Like the saloon, the new 5 Series Touring model is bigger in all the key areas and offers occupants plenty of room. Access through the car's front doors is good and the rear door aperture is generous for something in this class. Accessing the large boot is easy using both the main tailgate and the handy split tailgate feature that allows the window to be opened separately – very useful when the car is backed against a wall. BMW is well aware of the importance of communications kit in a car such as the 5 Series and has included Bluetooth mobile phone integration as standard. Buyers will also be able to upgrade to a full office compatibility system in due course, which will even read out emails on the move. The optional satellite navigation works well on the standard seven-inch screen and digital radio and MP3 music player connectivity can also be specified. Sound quality from the standard equipment will happily suffice. As with the saloon model, lighter hues work best and show off the exterior details in a way darker shades do not. 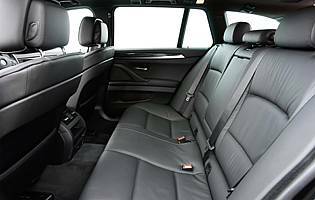 Inside, leather is standard across the range and the single SE trim level brings plush carpeting and stylish high gloss panels contrasting with aluminium detailing. Individual trim options can be specified and the M Sport package brings interior and exterior sports adornments. BMW's excellent Park Distance Control is standard equipment, which makes manoeuvring the large Touring model considerably easier aided by the large on-screen guide and the audible warning. The rear-drive layout means the turning circle is good, but drivers not used to such large vehicles may find suitable parallel parking opportunities hard to come by at first. Petrol engine options – 3.0-litre (204bhp); 3.0-litre (258bhp); 3.0-litre (306bhp); 3.0-litre (407bhp). Diesel engine options – 2.0-litre (184bhp); 3.0-litre (204bhp); 3.0-litre (245bhp). Transmission options: six-speed manual gearbox, eight-speed automatic gearbox. Trim levels: SE, M Sport.